Status: Deceased; Active 1970-1992. Born: 1942-04-11. Died: 2014-09-20. Spaceflights: 1 . Total time in space: 211.38 days. Birth Place: Enem, Adygeya. Graduated from Air Force Academy. Retired for medical reasons (due to injuries he received as the victim in an armed robbery). From 1992 to 1999, Deputy President, Russian Space Federation. Call sign: Elbrusy (Elbrus - tallest mountain in Europe). Family: Cosmonaut. Country: Russia. Spacecraft: Salyut 7, Mir. Flights: Soyuz 21, Soyuz 23, Soyuz 24, Soyuz 25A, TKS-1, Salyut 7/TKS-2, Soyuz T-5, Soyuz T-7, Salyut 7/TKS-3, Soyuz T-11, Soyuz T-15A, Soyuz TM-6. Agency: VVS. Bibliography: 4452, 5162. 1942 April 11 - . Birth of Anatoli Nikolayevich Berezovoi - . Nation: Russia. Related Persons: Berezovoi. Russian pilot cosmonaut 1970-1992. 1 spaceflight, 211.4 days in space. Flew to orbit on Soyuz T-5 (1982). From 1992 to 1999, Deputy President, Russian Space Federation.Retired for medical reasons (due to injuries he received as the victim in an armed robbery). 1970 March 24 - . Only nine of 16 cosmonaut-finalists cleared by the KGB and Communist Party - . Nation: Russia. Related Persons: Berezovoi, Dedkov, Dzhanibekov, Fefelov, Illarionov, Isaulov, Kozlov, Vladimir, Popov, Romanenko. Kamanin reports that only nine of 16 cosmonaut-candidates that completed the arduous selection process have been cleared by the KGB and Communist Party for actual acceptance for cosmonaut training. He feels this makes the whole time-consuming selection process a waste of time. The VVS is reluctant to submit officers as cosmonaut candidates, fearing that if they fail the vestibular table tests they will not only be rejected as cosmonauts, but be unable to return to flight duty with the Air Force. The result is a final selection of dullards, who are not intellectual, or literary, or sports enthusiasts, who are poor readers and not really interested in spaceflight or cosmonautics. The final decree has been issued reorganising TsUKOS as GUKOS. Soviet Air Force Cosmonaut Training Group 5 selected. - . Nation: Russia. Related Persons: Berezovoi, Dedkov, Dzhanibekov, Fefelov, Illarionov, Isaulov, Kozlov, Vladimir, Popov, Romanenko. 1970 April 30 - . Pressure on cosmonauts for more public relations tasks. - . Nation: Russia. Related Persons: Berezovoi, Dedkov, Dzhanibekov, Fefelov, Illarionov, Isaulov, Kozlov, Vladimir, Popov, Romanenko. Kamanin notes that the 27 April decree has selected only nine new cosmonauts from 300 pilot and 100 engineer candidates. He believes at least 30 should have been selected. Currently there are only 18 active cosmonauts, but Kamanin feels he needs at least 100, just to cover all the public relations appearance demands made on them. 1976 July 6 - . 12:08 GMT - . Launch Site: Baikonur. Launch Complex: Baikonur LC1. LV Family: R-7. Launch Vehicle: Soyuz 11A511. Soyuz 21 - . Call Sign: Baikal (Baikal - lake in Siberia). Crew: Volynov, Zholobov. Backup Crew: Rozhdestvensky, Zudov. Support Crew: Berezovoi, Glazkov, Gorbatko, Lisun. Payload: Soyuz 7K-T(A9) s/n 41. Mass: 6,800 kg (14,900 lb). Nation: Russia. Agency: MOM. Program: Almaz. Class: Manned. Type: Manned spacecraft. Flight: Soyuz 21. Spacecraft Bus: Soyuz. Spacecraft: Soyuz 7K-T/A9. Duration: 49.27 days. Decay Date: 1976-08-24 . USAF Sat Cat: 8934 . COSPAR: 1976-064A. Apogee: 274 km (170 mi). Perigee: 246 km (152 mi). Inclination: 51.60 deg. Period: 89.70 min. Soyuz 21 with Volynov and Zholobov aboard hard-docked with the station on 6 July 1976 after failure of the Igla system at the last stage of rendezvous. Towards the end of the two month mission an early return to earth was requested due to the poor condition of flight engineer Zholobov (who was suffering from space sickness and psychological problems). 1976 October 14 - . 17:39 GMT - . Launch Site: Baikonur. Launch Complex: Baikonur LC1. LV Family: R-7. Launch Vehicle: Soyuz 11A511. Soyuz 23 - . Call Sign: Radon (Radon ). Crew: Rozhdestvensky, Zudov. Backup Crew: Glazkov, Gorbatko. Support Crew: Berezovoi, Lisun. Payload: Soyuz 7K-T(A9) s/n 65. Mass: 6,760 kg (14,900 lb). Nation: Russia. Agency: MOM. Program: Almaz. Class: Manned. Type: Manned spacecraft. Flight: Soyuz 23. Spacecraft Bus: Soyuz. Spacecraft: Soyuz 7K-T/A9. Duration: 2.00 days. Decay Date: 1976-10-16 . USAF Sat Cat: 9477 . COSPAR: 1976-100A. Apogee: 269 km (167 mi). Perigee: 239 km (148 mi). Inclination: 51.60 deg. Period: 89.50 min. The Soyuz 23 ferry spacecraft suffered a docking system failure. Sensors indicated an incorrect lateral velocity, causing unnecessary firing of the thrusters during rendezvous. The automatic system was turned off, but no fuel remained for a manual docking by the crew. 1977 February 7 - . 16:10 GMT - . Launch Site: Baikonur. Launch Complex: Baikonur LC1. LV Family: R-7. Launch Vehicle: Soyuz-U. Soyuz 24 - . Call Sign: Terek (Terek - river in the Caucasus). Crew: Glazkov, Gorbatko. Backup Crew: Berezovoi, Lisun. Support Crew: Kozelsky, Preobrazhensky. Payload: Soyuz 7K-T(A9) s/n 66. Mass: 6,800 kg (14,900 lb). Nation: Russia. Agency: MOM. Program: Almaz. Class: Manned. Type: Manned spacecraft. Flight: Soyuz 24. Spacecraft Bus: Soyuz. Spacecraft: Soyuz 7K-T/A9. Duration: 17.73 days. Decay Date: 1977-02-25 . USAF Sat Cat: 9804 . COSPAR: 1977-008A. Apogee: 264 km (164 mi). Perigee: 226 km (140 mi). Inclination: 51.60 deg. Period: 89.30 min. Soyuz 24 docked with Salyut 5 and brought repair equipment and equipment for a change of cabin atmosphere. This special apparatus was designed to allow the entire station to be vented through the EVA airlock. Because of this the planned EVA was cancelled. However analysis after arrival showed no toxins in the air. The crew changed the cabin air anyway, then returned to earth. The mission, although a short 18 days, was characterised as a busy and successful mission, accomplishing nearly as much as the earlier Soyuz 21's 50 day mission. Soyuz 25A (cancelled) - . Crew: Berezovoi, Lisun. Backup Crew: Kozelsky, Preobrazhensky. Nation: Russia. Related Persons: Chelomei, Glushko. Program: Almaz. Flight: Soyuz 25A. Spacecraft Bus: Soyuz. Spacecraft: Soyuz 7K-T.
A Soyuz 25 mission to the Salyut 5 space station with the crew of Berzovoi and Lisun was to have followed Soyuz 24. However during the four months it took to prepare the Soyuz, Salyut 5 consumed higher than expected fuel in maintaining the station's orientation. The flight was cancelled and the spacecraft allocated for Soyuz 25 flew as Soyuz 30 to Glushko's civilian Salyut station. 1981 Beginning of - . TKS-1 (cancelled) - . Crew: Berezovoi, Glazkov, Makrushin. Backup Crew: Artyukhin, Kozelsky, Romanov. Nation: Russia. Program: Almaz. Flight: TKS-1. Spacecraft: TKS. Planned first test manned flight of the TKS large ferry craft. Would have docked with the Almaz OPS 4 military space station. Flight cancelled with the rest of the Almaz program in 1981. The spacecraft was instead flown unmanned to Salyut 6 as Cosmos 1267. 1982 May 13 - . 09:58 GMT - . Launch Site: Baikonur. Launch Complex: Baikonur LC1. LV Family: R-7. Launch Vehicle: Soyuz-U. Soyuz T-5 - . Call Sign: Elbrus (Elbrus - tallest mountain in Europe). Crew: Berezovoi, Lebedev. Backup Crew: Strekalov, Titov, Vladimir. Payload: Soyuz T s/n 11L. Mass: 6,850 kg (15,100 lb). Nation: Russia. Agency: MOM. Program: Salyut 7. Class: Manned. Type: Manned spacecraft. Flight: Soyuz T-5. Spacecraft Bus: Soyuz. Spacecraft: Soyuz T. Duration: 106.21 days. Decay Date: 1982-08-27 . USAF Sat Cat: 13173 . COSPAR: 1982-042A. Apogee: 231 km (143 mi). Perigee: 190 km (110 mi). Inclination: 51.60 deg. Period: 88.70 min. 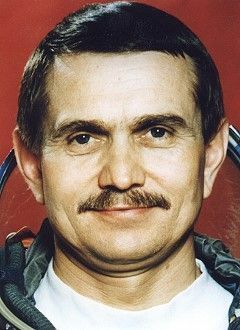 Carried Anatoli Berezovoi, Valentin Lebedev to Salyut 7 to conduct scientific research and experiments; returned crew of Soyuz T-7 to Earth..
1982 July 30 - . 02:39 GMT - . EVA Salyut 7 EO-1-1 - . Crew: Berezovoi, Lebedev. EVA Duration: 0.11 days. Nation: Russia. Related Persons: Berezovoi, Lebedev. Program: Salyut 7. Class: Manned. Type: Manned space station. Flight: Soyuz T-5. Spacecraft Bus: Almaz. Spacecraft: Salyut 7. Stand-Up External Vehicular Activity. Retrieved and installed material samples. Tested equipment..
Salyut 7/TKS-2 (cancelled) - . Crew: Glazkov, Makrushin, Stepanov, Eduard. Backup Crew: Artyukhin, Berezovoi, Yuyukov. Nation: Russia. Related Persons: Chelomei, Ustinov. Program: Salyut 7. Flight: Salyut 7/TKS-2. Following the cancellation of the Almaz military station it was still planned that two of the TKS ferries would be flown manned to Salyut stations. In September/October 1979 three crews were formed. In December 1981 Ustinov killed Chelomei's plans for manned TKS flights. The TKS training group was dissolved and TKS-2 flew unmanned to Salyut 7 as Cosmos 1443. 1982 December 10 - . Landing of Soyuz T-7 - . Return Crew: Berezovoi, Lebedev. Nation: Russia. Related Persons: Berezovoi, Lebedev. Program: Salyut 7. Flight: Soyuz T-5. Soyuz T-7 landed at 19:03 GMT, 118 km E of Dzhezkazgan, with the crew of Berezovoi and Lebedev aboard..
Salyut 7/TKS-3 (cancelled) - . Crew: Preobrazhensky, Romanov, Sarafanov. Backup Crew: Artyukhin, Berezovoi, Yuyukov. Nation: Russia. Related Persons: Chelomei, Ustinov. Program: Salyut 7. Flight: Salyut 7/TKS-3. Planned second manned flight of TKS ferry to the Salyut 7 space station. The crews were assigned in September/October 1979. But in December 1981 Ustinov killed Chelomei's plans for manned TKS flights. The TKS training group was dissolved and TKS-3 flew unmanned to Salyut 7 as Cosmos 1686. 1984 April 3 - . 13:08 GMT - . Launch Site: Baikonur. Launch Complex: Baikonur LC31. LV Family: R-7. Launch Vehicle: Soyuz-U. Soyuz T-11 - . Call Sign: Yupiter (Jupiter ). Crew: Malyshev, Sharma, Strekalov. Backup Crew: Berezovoi, Grechko, Malhotra. Payload: Soyuz T s/n 17L. Mass: 6,850 kg (15,100 lb). Nation: Russia. Agency: MOM. Program: Salyut 7. Class: Manned. Type: Manned spacecraft. Flight: Soyuz T-10, Soyuz T-11. Spacecraft Bus: Soyuz. Spacecraft: Soyuz T. Duration: 181.91 days. Decay Date: 1984-10-02 . USAF Sat Cat: 14872 . COSPAR: 1984-032A. Apogee: 224 km (139 mi). Perigee: 195 km (121 mi). Inclination: 51.60 deg. Period: 88.70 min. Manned three crew. Docked with Salyut 7.Transported a Soviet-Indian international crew comprising ship's commander Y V Malyshev, flight engineer G M Strekalov (USSR) and cosmonaut-researcher R Sharma (India) to the SALYUT-7 orbital station to conduct scientific and technical studies and experiments. Soyuz T-15A (cancelled) - . Crew: Levchenko, Manarov, Volynov. Backup Crew: Berezovoi, Shchukin, Solovyov. Nation: Russia. Program: Salyut 7. Flight: Soyuz T-15A. Spacecraft Bus: Soyuz. Spacecraft: Soyuz T. Final expedition to Salyut 7 station was cancelled when control was lost..
1988 August 29 - . 04:23 GMT - . Launch Site: Baikonur. Launch Complex: Baikonur LC1. LV Family: R-7. Launch Vehicle: Soyuz-U2. Soyuz TM-6 - . Call Sign: Proton (Proton ). Crew: Lyakhov, Mohmand, Polyakov. Backup Crew: Arzamazov, Berezovoi, Masum. Payload: Soyuz TM s/n 56. Mass: 7,070 kg (15,580 lb). Nation: Russia. Agency: MOM. Program: Mir. Class: Manned. Type: Manned spacecraft. Flight: Soyuz TM-4, Soyuz TM-6, Soyuz TM-6 Mir LD-2. Spacecraft Bus: Soyuz. Spacecraft: Soyuz TM. Duration: 114.23 days. Decay Date: 1988-12-21 . USAF Sat Cat: 19443 . COSPAR: 1988-075A. Apogee: 228 km (141 mi). Perigee: 195 km (121 mi). Inclination: 51.60 deg. Period: 88.70 min. Transported to the Mir orbital station a Soviet-Afghan crew comprising the cosmonauts V A Lyakhov, V V Polyakov and A A Momand (Afghanistan) to conduct joint research and experiments with the cosmonauts V G Titov and M K Manarov. Returned Manarov, Titov (Soyuz TM-4), Chretien (Soyuz TM-7) to Earth. Initial orbit 195 X 228 km at 51. 57 deg. Maneuvered to a 235 x 259 km orbit, then docked with Mir at 05:41 GMT on 31 August at its 339 x 366 km orbit. Moved from aft to forward port 8 Sept 88. 2014 September 20 - . Death of Anatoli Nikolayevich Berezovoi. - . Related Persons: Berezovoi. Russian pilot cosmonaut 1970-1992. 1 spaceflight, 211.4 days in space. Flew to orbit on Soyuz T-5 (1982)..